Germination is the first crucial step in the life cycle of obligate root parasitic Orobanchaceae, which cannot survive on their own. Therefore, germination of the tiny seeds with minimal reserves should occur only near host roots. 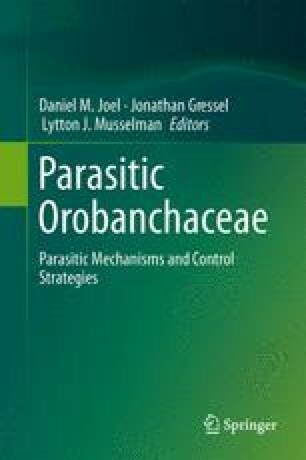 These parasites detect the presence of hosts by using root-derived signalling molecules belonging to several distinct classes of metabolites. Strigolactones, the most important germination stimulants, are derived from carotenoids through the action of carotenoid isomerase, carotenoid cleavage dioxygenases, and possibly a cytochrome P450 enzyme. Strigolactone production is increased under phosphate and nitrogen deficiencies. Strigolactones also attract arbuscular mycorrhizal fungi and act as plant hormones that decrease shoot and increase root branching. Various strigolactones have been identified, and the biological processes have differential sensitivity to different strigolactones. Germination stimulants may be a target for the control of parasitic weeds, but considering their other biological functions, such strategies need to be carefully analyzed for unwanted side effects. KY acknowledges grants from KAKENHI (18208010, 23338006) and Program for Promotion of Basic and Applied Researches for Innovations in Bio-oriented Industry. HB acknowledges funding by the Netherlands Organization for Scientific Research (NWO; VICI grant, 865.06.002 and Equipment grant, 834.08.001). He was co-financed by the Centre for BioSystems Genomics (CBSG) which is part of the Netherlands Genomics Initiative/Netherlands Organization for Scientific Research.